Probably the most iconic and favourite of all Montessori materials, the Pink Tower was designed by Dr. Maria Montessori herself. It remains unchanged through time and you’ll find it in Montessori classrooms around the world. It consists of 10 wooden cubes, ranging in size from 1 cubic centimetre to 10 cubic centimetres, differing in three dimensions. Just a stack of blocks? You could look at the Pink Tower and say ‘it’s just a stack of blocks’, but it’s actually so much more than that. The Pink Tower is a scientifically designed material in the Sensorial Area of the classroom. Dr. Montessori believed that working with the Sensorial materials enables the children to refine their senses, have a clearer understanding of what they are seeing, feeling, touching or smelling, and helps with the development of intelligence. Importantly, the cubes in the Pink Tower are all the same colour, shape and texture. This helps the child to focus on one important quality of the material - size! The Pink Tower aims to refine a child's visual sense by discriminating differences in dimension. As a child starts taking each cube (starting from the smallest) to a mat, they can feel the weight and progression of its size. As they build the Tower, they refine their voluntary movement. The child learns self-control by doing the activity precisely and exactly. 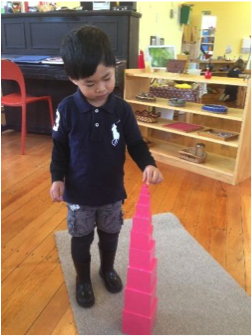 When a child first attempts to build the Pink Tower, they may not be able to do it exactly right, they may not be able to control their movements yet. Through repetition and development of their hand-eye coordination, the child is able to make their hands move in a precise way. This is the key to self-control. When the child masters the skill, they master themself, by mastering their actions. Using their visual perception, the child can self-assess whether they’ve built the Tower in order. This control of error helps the child realize what’s wrong and correct any mistakes. Through this, the child grows more independent and confident. Indirectly the Pink Tower prepares the child for Language and Maths. It prepares the hand for writing, as children need to use the 3-finger grip to carry the cubes. Through language games, new vocabulary is introduced to the child such as cube, large, small, bigger and biggest. This enables the child to further explore their environment and find something small, large or something “bigger than this”. It also encourages the child to use descriptive language in the environment. The Pink Tower also prepares the mathematical mind. It indirectly introduces the Decimal System, as the child works with 10 cubes which represents the numbers 1-10. It also introduces Geometry, as the child explores the different cubes and their dimensions. These concepts are not introduced to the child, but are absorbed by their Absorbent Mind. Who would have thought that such a simple material could introduce so many different concepts to a child? So, why is the Pink Tower pink? And to answer the mystery as to why the Pink Tower is pink, Dr. Maria Montessori experimented with different colours and she observed that the children were more attracted to the colour pink, compared to the other colours. After all, now you know just how amazing this simple tower of blocks is, who wouldn’t be enticed by the beauty and elegance of the iconic Pink Tower?